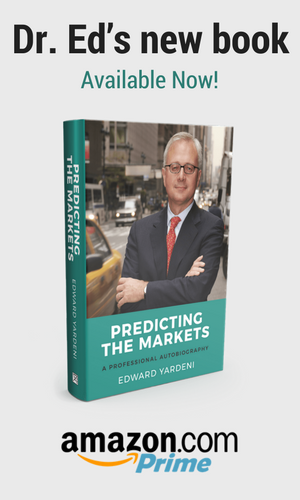 May I suggest you take my recently published book Predicting the Markets: A Professional Autobiography along to the beach this summer? If you like reading biographical histories that focus on financial markets and the economy, you should enjoy my book. If you prefer thrillers, then The President Is Missing by Bill Clinton and James Patterson might be a better choice. I wrote my book to share what I have learned over the past 40 years as an economist and investment strategist on Wall Street. My hope is that investors in my age bracket find it to be an enjoyable and thought-provoking walk down Memory Lane and that younger folks find plenty of insights they can put to good use in their financial life. In writing the book, I’ve avoided jargon for a narrative that appeals mostly to one’s common sense. My career has provided me with lots of opportunities for testing theories, and for learning from both successes and mistakes. I started my career on the Street at EF Hutton in 1978. The Dow Jones Industrials Average was around 1000 at the time. Now it is over 25000. I’ve been bullish most of that time. However, I also stumbled a few times along the way. For example, I didn’t foresee the flash crash on Black Monday October 19, 1987. But I argued that it was a buying opportunity because the outlook for earnings remained solid. During 1999, I turned negative on tech stocks because they seemed significantly overvalued. I also warned that the Y2K problem might cause a recession. It did, but I was right for the wrong reason: Computer systems continued to work just fine after the stroke of midnight 2000; however, so much money had been spent on fixing the problem that sales of information technology hardware and software plummeted, depressing the economy. From 2003 through 2007, I grew increasingly bullish owing to the positive implications I saw for commodity prices—and for the Materials, Energy, and Industrial sectors of the S&P 500—when China emerged as a major driver of the global economy. I turned bearish on the S&P 500 Financials sector on June 25, 2007, but I wasn’t bearish enough on the overall market because I never expected that the federal government would let Lehman fail, as it did on September 15, 2008. I did better at calling the major market bottoms in August 1982 and March 2009. During my career so far, inflation has trended downward. Fortunately, I was an early proponent of “disinflation.” I never bought the idea promoted by Milton Friedman that inflation is solely a monetary phenomenon that can be controlled by the Fed or any other central bank. Instead, my view has been that price inflation is also determined by more microeconomic factors, particularly the competitiveness of markets. Globalization, deregulation, and the advance of information technologies have been major forces heightening competition, in the US and abroad, over the past few decades. Following the Great Recession of 2008, the major central banks sought to avoid deflation and adopted 2.0% inflation targets. They lowered their official interest rates close to zero and pumped liquidity into their economies with quantitative easing programs, i.e., by purchasing bonds in the capital markets. Yet inflation remains remarkably subdued, with relatively lackluster economic growth among the major industrial economies. Much of the liquidity seems to have gone into the financial markets, driving bond yields lower and stock prices higher. Real estate also has benefited from the ultra-easy policies of the central bankers. (2) The Phillips curve isn’t working. In the US, Fed officials have been expecting that their policies would lower the unemployment rate and boost wage inflation, which would be marked up into price inflation. They based that on the Phillips Curve Model, which posits an inverse correlation between the inflation rate and unemployment rate. The jobless rate dropped below 4.0% recently, the lowest in decades. Yet wage inflation remains subdued. Globalization and technological innovation may account for much of the “flattening” of the Phillips curve. Globalization is currently being challenged by President Donald Trump’s protectionist saber-rattling, while technological innovation seems to be happening at a faster and faster pace. The jury is out, but I expect that the net effect will be that inflation remains subdued. (3) No boom, no bust. Inflation is a key driver of the business cycle. In the past, recessions were followed by recoveries, with GDP regaining what was lost during the downturn. During the subsequent expansion phase, GDP rose to record highs. Along the way, excesses developed as businesses scrambled to add capacity and to hire more workers at higher wages. The good times encouraged more borrowing to finance the expansion. Debt-to-income ratios rose rapidly. The Fed was clearly behind the curve, and raced to get ahead of rising inflationary pressures. Rapidly rising short-term rates triggered a financial crisis as some borrowers failed to service their debts when their sales disappointed. That triggered a widespread credit crunch as even good borrowers were denied refinancing by their lenders, who were plagued by mounting bad loans. The yield curve inverted as investors in Treasury bonds started to anticipate that the boom soon would be followed by a bust, which invariably happened. This time may or may not be different. But for now, business managers are remaining relatively cautious. Many of them faced a near-death experience during the Trauma of 2008. Ever since, they seem to have been focusing on increasing their profit margins, which rose to a record high for the S&P 500 during the fourth quarter of 2017, before Trump’s tax cut, and even higher during the first quarter of this year, after the tax cut. Also different this time, so far, is that the flattening yield curve may reflect investors’ perceptions that the Fed is ahead of the inflation curve, which explains why Treasury bond yields aren’t rising as rapidly as the federal funds rate. Furthermore, the US bond market has been globalized in recent years, with record-low yields in the Eurozone and Japan keeping US yields lower than otherwise. (4) Profits drive the economy. Economists and investors tend to focus on the business cycle, which I believe is driven by the profits cycle. While politicians pat themselves on the back for creating jobs, it is businesses that actually do the hiring, especially small ones that aspire to grow into bigger ones. Profitable companies expand their capacity and increase their payroll head count. Unprofitable companies retrench across the board. Record-high profit margins show no signs of fulfilling bearish market prognosticators’ warnings throughout the bull market that they are bound to revert to their means. (5) Forward earnings drive the stock market. Forecasting the stock market should be easy since it involves forecasting just two variables—namely, earnings (E) and the valuation multiple (P/E). Getting them right is the hard part. In my book, I explain why I favor tracking the industry analysts’ consensus expectations for the operating earnings of the S&P 500 on a weekly basis. In my opinion, the market discounts forward earnings, which is a time-weighted average of the consensus forecasts for the current year and the coming year. S&P 500 forward earnings rose to a record high at the end of last year, before Trump’s tax cuts took effect. They shot up in January when the tax cuts became effective. Yet stock prices have been zigzagging since late January on fears that the Fed’s interest-rate hikes and balance-sheet tapering might cause a financial crisis, as happened during previous tightening rounds. There’s mounting evidence that the normalization of monetary policy in the US may be stirring up an emerging markets crisis. Trump’s protectionist saber-rattling is another source of concern, though most cyclical sectors of the S&P 500 have been outperforming the overall index so far this year, while the “safe” interest-rate-sensitive sectors have been hard hit by the rising bond yield. With forward earnings continuing to rise into record territory, the zigzagging stock market has been driven by the zigs and zags in the forward P/E. Valuation multiples that were awfully high in January are closer to their long-run fair values based on forward P/Es. I devote a chapter of my book to all the widely followed valuation metrics. P/Es based on forward earnings tend to be too optimistic, especially just before recessions; that’s because industry analysts collectively don’t see recessions coming and must slash their forecasts as recessions unfold. On the other hand, P/Es based on trailing earnings (like Shiller’s CAPE, which is based on 10-years-trailing earnings) tend to be overly and prematurely bearish during bull markets. (6) The end is far. Lots can go wrong in the foreseeable future. Trump’s protectionist saber-rattling could trigger a global trade war. The Fed could trigger another financial crisis, especially among emerging market economies. In the intermediate term, say the next 12 months, inflation could make a surprising comeback (at least surprising to me), forcing the Fed to tighten more aggressively. In the long term, say the next one to three years, swelling federal government budget deficits combined with the Fed’s balance-sheet tapering could push up bond yields to levels that cause trouble. I might be overstaying my welcome in the bullish camp, but I believe that strong earnings will remain the signal that the market heeds. I’ve noted since the start of the bull market that it was prone to panic attacks on fears of another trauma like the 2008 calamity. I’ve consistently argued that they would pass, followed by relief rallies. One day, there will be a recession and a bear market. But as long as inflation remains subdued, the Fed is unlikely to raise interest rates to levels that precipitate these events. I expect that the current economic expansion will continue through at least July 2019, when it will become the longest one since the end of World War II. (7) Technology is often a pleasant surprise. By now, you may have concluded that I am an optimist. Guilty as charged. I’m looking forward to writing a book about the next 40 years of my career, and I’m counting on biotech innovations to keep me going that long. Technological innovations are mostly ignored by economists, particularly of the pessimistic variety. They often fail to foresee, let alone to see, that the inexorable advance of technology is a major source of productivity, which keeps a lid on inflation and boosts both profits and standards of living.